It's Friday! Not only does that mean that the weekend is upon up (can I get a whoop! whoop! ), I'm updating on my quilt progress. I'm thrilled with my progress this week. It's really starting to take shape. It doesn't hurt that the blocks themselves are super simple, so once I got them cut out it was just a matter of sewing them into rows and then sewing the rows together. I confess that I get bored sewing quilts. It's such tedious work. The only reason I keep doing it is that I love to see them come together. There's something deeply satisfying to me about cutting large pieces of fabric into tiny little squares and then sewing them back together again. It's just so pretty! 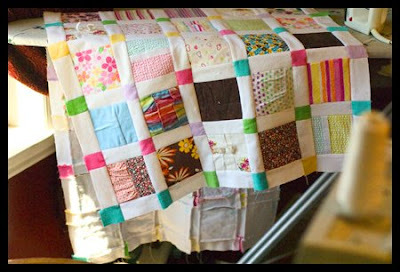 I love the charm and mystery of quilts. You just never know quite what they will look like once they are finished. Ok, now to the fun stuff! The photos. . . 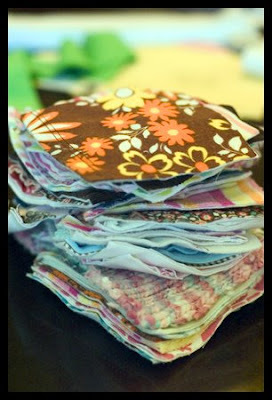 Here are the stack of squares that still need to be sewn into rows. There are a total of 13 rows. I have 5 more rows to sew. 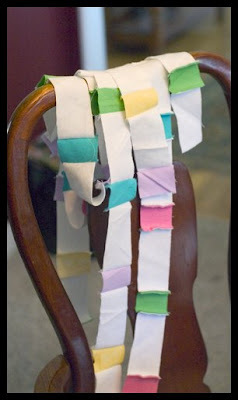 The sashing that goes between the squares. This is so hard to get right. You have to be so precise. I'm not a fan of being precise. I usually fudge it and wiggle it to make it fit. By the way, these pictures are taken in my mom's dining room. She's a huge fan of the Queen Anne style. I like it, but if it were my home, there probably wouldn't be any Queen Anne. Just so ya know. Rows sewn together, ready to be sewn into the quilt. 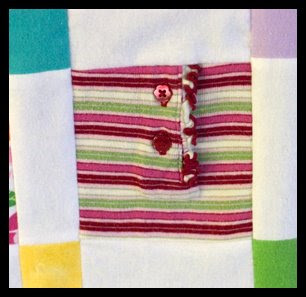 A close up of one of the blocks, after it's been sewn in. I broke a needle sewing with too little caution. 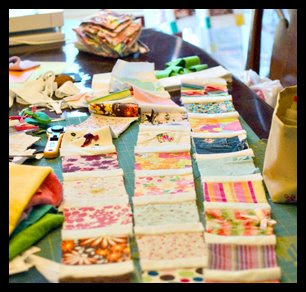 There are snaps and zippers and stuff all over the place, so I'm learning to take it slow and examine each square before sewing it. Did I mention I use my mom's machine? She has a beautiful Pfaff and I would hate to break it (since my sewing machine death count is 3 to date, I'm trying to be nicer to my machines instead of sending them scurrying for shelter at the sewing machine repair shop). OOO, five of the rows sewn together. Hanging out on the ironing board. The five rows so you can really see them! I wasn't too sure about the colored squares between them, but since the people had spoken. . . you all were right though. I think it looks great! My goal for next week is to have the top all the way done! Gorgeous! I need to learn to sew, so I have can have pretty quilts with big meaning. I can't get over how beautiful it is. 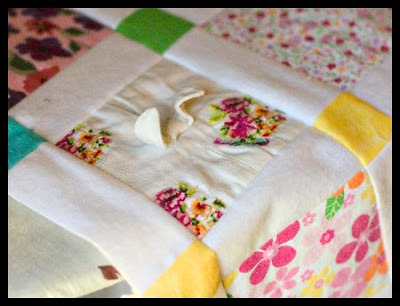 Kara, the quilt is absolutely gorgeous! I love how you left the buttons and such in the squares. This quilt will be such a treasure! I love it. The quilt looks awesome! Good job on lining everything up! 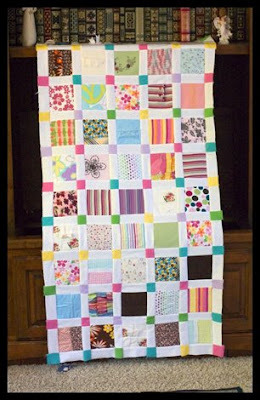 Came across your blog, and this quilt is absolutely BEAUTIFUL. L-O-V-E it!!!!! Wow. It does look great! I love it!